This eye-catching salad is just as delicious as it looks. With an array of colors, flavors and textures, this salad is also packed with nutrients: protein, fiber, healthy fats, and antioxidants, just to name a few. This recipe serves four but this salad can easily be assembled for lunch for one. Place chicken breasts in a baking dish. Brush with olive oil and season with salt and pepper. Bake for 20 minutes until chicken is no long pink. Remove from oven and set aside to cool. Once cooled, slice chicken into strips. Meanwhile, prepare the dressing. Whisk together yogurt, apple cider vinegar, olive oil, honey, poppy seeds, and salt in a small dish. 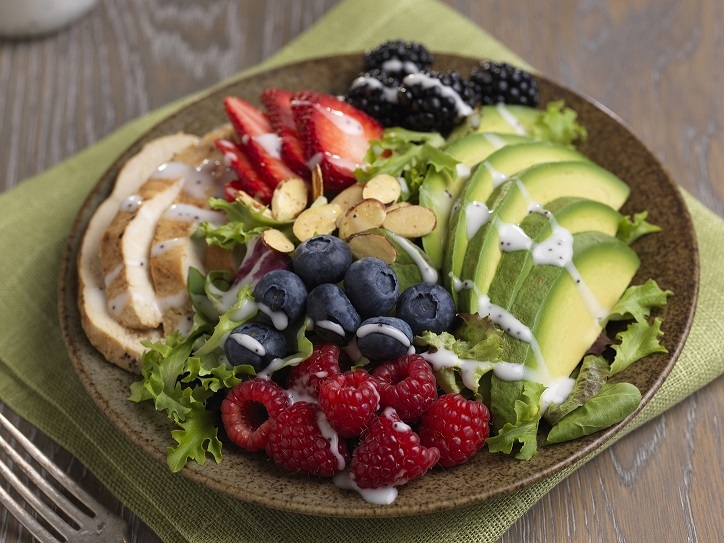 To assemble the salads, divide equal amounts of spring mix, sliced chicken, sliced avocado, sliced strawberries, blueberries, blackberries, raspberries and sliced almonds among four dishes. To serve, drizzle with poppy seed dressing as desired. © 2019 Naturipe Farms, LLC. All rights reserved.